11 days from £4435pp plus international flights. 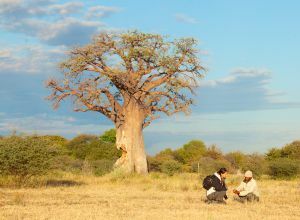 Enjoy diverse African landscapes from the thunderous Victoria Falls, to the serene wildlife-filled wilderness of the Okavango Delta, and across to the dramatic Nxai Pan. 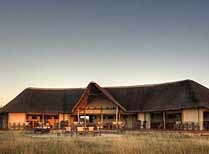 This is a varied tailor-made Botswana safari taking in some of the best sights of this beautiful country. If you're looking for an exceptional wildlife and wilderness safari, with comfortable places to stay, good guiding, and exciting experiences, this could be right for you. 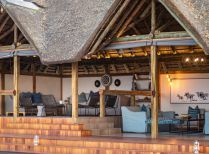 You have two nights each at Livingstone (Victoria Falls), Chobe Elephant Camp in Chobe, Splash Camp and Pom Pom Camp in the Okavango Delta, and Nxai Pan Camp. In addition to some road transfers you will also be flown over some of these picturesque areas by light aircraft which is both exciting and awe-inspiring. In general the wildlife on this trip should be good whatever the time of year, though the dry season (around May to October/November) tends to bring the best sightings of larger mammals as they are drawn to the water sources of the Delta and the Chobe and any waterholes. The greener months of November to April tend to find the wildlife less concentrated by water sources, but the landscape is lush and it is the birthing season, which brings inevitable and dramatic predator and prey interaction. This is also one of the best times for keen birders. We have travelled these areas and know these camps, so we can answer any questions you have about whether this safari might be right for you. 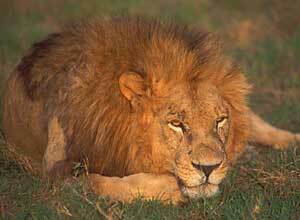 We look forward to hearing from you if we can help you plan this or another Botswana safari. We will meet you at Livingstone Airport and drive you to Waterberry Lodge, which is about 20kms from Livingstone on the banks of the Zambezi River. It's a lovely quiet spot and you have two nights here. Whilst here you can choose 2 activities per day from the following list: tour of Victoria Falls, sunset cruise, daytime cruise, fishing, island picnic, guided birding, guided village walk, guided tour of Livingstone town and markets. 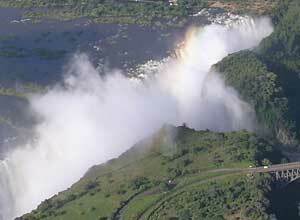 Enjoy another day of activities in the Victoria Falls region. Bear in mind that as well as you included activities, you could also choose to do other activities available here, such as whitewater rafting, helicopter rides over the Falls or bungy jumping! At Waterberry, enjoy a peaceful setting and some great food. 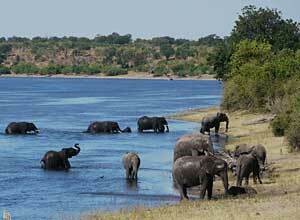 After breakfast we will take you over to Botswana, to Chobe Elephant Camp in the Chobe Forest area. 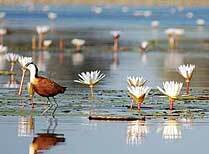 The roughly 2 hour journey includes a short motor boat trip over to Kasane, the town adjacent to Chobe. 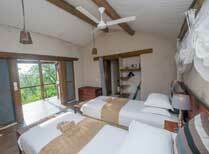 Your lodge is just a few miles out of Kasane in a peaceful valley. You have two days here, and there is a range of things to do. 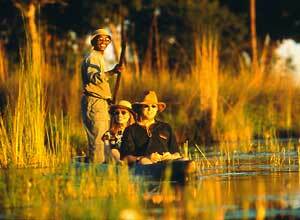 Perhaps today an afternoon boat trip on the Chobe River might be the perfect way to celebrate being in Botswana! 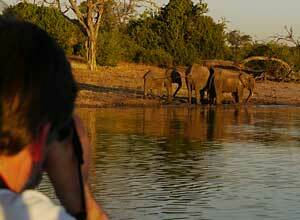 You'll be able to enjoy a game drive in the famous Chobe National Park. 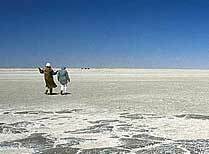 It is a park well known for its huge population of elephants, but that is certainly not all. 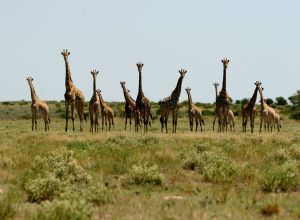 There is a wide diversity of wildlife here, from antelopes such as impala and sable, to giraffes, buffalos and hippos to predators such as lions, leopards and hyenas. Other activities you could enjoy from the lodge are nature walks and also a visit to the local village. Full board. 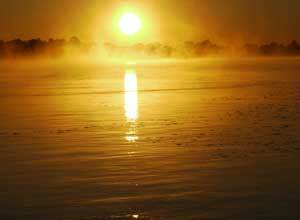 This morning we will drive you to Kasane Airport where you'll take a light plane to Kwara Reserve in the Okavango Delta. 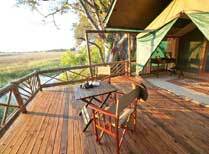 Your camp is on a private concession right next to Moremi Game Reserve. The diversity of the landscape here (permament water, floodplains,grasslands and pans) attracts an equal diversity of wildlife. You can enjoy the wildlife experience in a variety of ways here too. 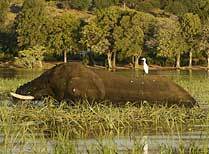 Day game drives are supplemented by guided walks, mokoro (dugout canoe) trips and motor boat trips too. Night drives are also possible here. Your days on safari in Splash Camp should be a real highlight. Enjoy an early breakfast this morning, as you anticipate another exciting day on safari, encountering all manner of wildlife. The guides here are accompanied by professional spotters on all vehicles, so your chances of finding game are optimised. After relaxing back at the camp during the lunchtime siesta, you'll be out again in the afternoon, and enjoying sundowners by the evening. After one last early morning game activity and breakfast, we will transfer you to your next Delta camp by light aircraft. Pom Pom Camp is to the west of Moremi Game Reserve. Offering night and day game drives, walks and mokoro excursions, your safari adventure in Botswana's most famous area, the Okavango Delta, continues with yet more excitement. A morning and an afternoon game activity is separated by a delicious lunch and a siesta back at camp. During the day you'll search for all the big predators and their plains game prey such as zebras, wildebeest, and antelopes. 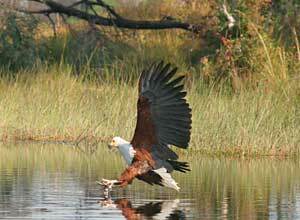 Birders might be lucky enough to spot a Pel's fishing owl, and you're sure to see African fish eagles. As the sun sets, stop for a G&T then try an exciting night drive back to camp. After your morning game activity, we'll fly you back to Nxai Pan for a change of scenery. This is a total contrast to the lush Okavango Delta, and one of the only places where you will see springbok and impala in the same place. Today you can go on a walking safari with San Bushmen, and enjoy game drives in this interesting landscape. Enjoy your last day on safari, and make the most of this lovely camp during the day. The wildlife you might see here varies depending on the time you visit, as it's very much a seasonal movement of game in this area. In the dry winter months, around June to November, you will often see big herds of elephants, plus large numbers of zebra and wildebeest (and their accompanying predators), though there is always resident wildlife around throughout the year. After breakfast and your morning game activity (a walk with Bushmen and/or a game drive) we will take you back to the airstrip to catch your flight to Maun. From here you will be able to link with your onward flights. Breakfast. Price notes: 2019 guide prices pp sharing (excluding international flights): 15-19 Dec 2018 and 5 Jan-Mar 2019 £4,435; Apr-Jun and 1-14 Nov £5,545; July-October £6,575. 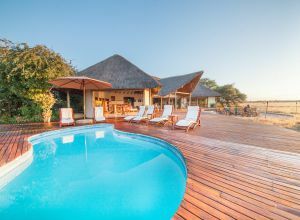 ACCOMMODATION/MEALS (based on twin share, with local drinks throughout except at Chobe Elephant Camp) - 2 nights FB at Waterberry; 2 nights FB at Chobe Elephant Camp; 2 nights FB at Splash; 2 nights FB at Nxai Pan. TRANSFERS - Road transfer from Livingstone airport to Waterberry Lodge; road and boat transfer from Waterberry to Chobe Elephant Camp; flight from Kasane to Splash Camp; flight from Splash Camp to Pom Pom; flight from Pom Pom to Nxai Pan; flight Nxai Pan to Maun. International flights and taxes; meals not mentioned; drinks at Chobe Elephant Camp and premium drinks at other lodges; park fee increases; insurance; visas; vaccinations; personal expenses; Christmas and New year surcharges (please ask). This trip starts in Livingstone and ends in Maun. From the UK, we recommend getting a flight with British Airways or South African Airways via Johannnesburg. A rough guide cost would be about £1200 pp. 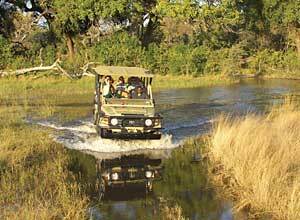 Departure dates: This excellent value Botswana safari is a tailor made trip which we can plan for you at any time you like. You can tweak any element of the trip to suit you. Just call us to help you plan this safari. A homely camp set on a high ridge with far-reaching views of the Chobe River and vast floodplains, just minutes from the national park.